Almost as soon as you finish building and moving into your new home, it will start to need repairs. While most of the major systems in your house will last for at least 10 to 15 years, almost immediately upon completion, little things will start to go wrong with your house. 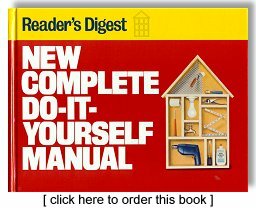 The New Complete Do-It-Yourself Manual - by Reader's Digest will help you identify the problem, tell you if it is something that you might want to repair by yourself, and if so, it will help guide you through the repair process. The step-by-step instructions and clear drawings will help you learn how to repair most of the things that go wrong in your home. It is one of the best home improvement books I have ever read and should be included in every homeowner's library. Some other do-it-yourself books that you may want to consider reading are listed below. The Complete Guide to Home Roofing Installation and Maintenance: How to Do It Yourself and Avoid the 60 Ways Your Roofer Can Nail You - by John W. Chiles Jr.